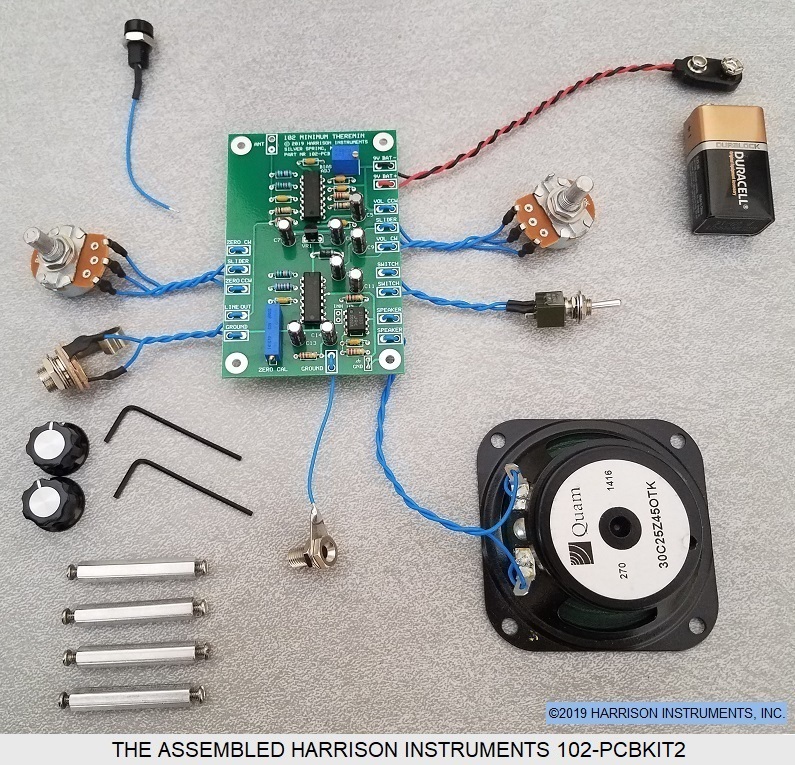 Welcome to Harrison Instruments, Inc.
with products proudly made in the USA ! theremin kits by Harrison Instruments - kits that are fun to build and fun to play! Our products effectively demonstrate one of the world's oldest and most unusual electronic musical instruments, to intrigue and inspire teens and adults alike. Comprehensive, clear assembly instructions will guide your students to completion, providing the correct level of interest and challenge for ages 15 and older. Inspire your technical students in perspectives of music through electronics with Harrison Instruments theremin kits, serving educators since 1999. This month, we are featuring our 102-PCBKIT2. Order 10 or more 102-PCBKIT2 kits and receive a 5% discount throughout April and May! Harrison Instruments designs quality theremins using a variety of technologies, and fabricates prototypes for both consumer-direct and OEM (Original Equipment Manufacturer) requirements. The owner of the company, Arthur Harrison, oversees the design and production of all Harrison Instruments theremins to provide the highest performance for cost, meeting his personal criteria for rugged, reliable and playable instruments that are acclaimed for their tonal quality and precision. Durability and craftsmanship make Harrison Instruments theremins an excellent value. Each of our products are rigorously tested and inspected to surpass the highest expectations for quality to meet the unique demands for science and engineering education, as well as the popular interest in kit-building. Harrison Instruments also provides numerous theremin kit products for both individual and classroom requirements. Our comprehensive assembly instructions and customer support make our kits a pleasure to build. Many of our customers are technical high schools and colleges, who repeatedly order our kits year after year to provide an effective and enjoyable student experience. The theremin, named for its inventor, Leon Theremin, was introduced in the 1920s as one of the first electronic musical instruments. Theremins are distinguished by the fact that they are played without the performer touching the instrument. 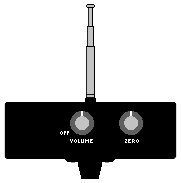 The musician moves his or her hands in proximity to the theremin to control the tone of the sound. While mastering the theremin requires skill, the challenge is exciting, and the rewards are great. Few musical instruments are capable of such intimate expression, nor provide the unique visual appearance of performance. Harrison Instruments provides theremin modules, and complete instruments. Here are some of our standard products, most available from stock. Application-specific products are also available for OEM applications. Please refer to improved product 206 (below) . Please note that we do not accept orders from ouside the United States through this website. Certain items may be ordered for export where ebay item numbers are shown. Items without ebay numbers may be requested for purchase through ebay by contacting us. Harrison Instruments provides convenient on-line ordering. Use our shopping cart for fast, easy transactions with PayPal®. Your payment details are communicated in a secure, encrypted format through the PayPal® website using SSL (Secure Socket Layer) technology. As an added convenience, PayPal® will allow purchases with all major credit cards, even without a PayPal® account. We do not share our customers' names, addresses, or any other personal information with any third parties, and do not send unsolicited information to our customers by postal or electronic mail. Shipping charges, when they apply, are calculated as follows. Amounts shown are in U.S. dollars. Orders shipped to destinations in Maryland are subject to a 6% state sales tax. Harrison Instruments uses United States Post Office Priority Mail®. Orders usually arrive within 2 to 4 days from the time of shipment. Please Note: Harrison Instruments will refund the full value of merchandise minus a restocking fee of 10% of the merchandise cost, or $10.00, whichever is greater, if it is returned within 45 calender days of receipt, and is unopened, undamaged, and in its original package, by crediting the purchaser's account. Harrison Instruments will not refund the original shipping and handling costs, nor the return shipping and handling costs, of returned merchandise. Harrison Instruments will not refund the shipping and handling costs of merchandise which is returned undeliverable due to incorrect address information provided by the purchaser or their agent, nor the inability of the purchaser or their agent to accept merchandise upon delivery. Some postal carriers may require a customer signature for delivery of merchandise, and the inability to obtain a customer signature may result in non-delivery. designs may satisfy your needs, and we'll be happy to discuss custom designs, as well. ©2019 by Harrison Instruments, Inc. All rights reserved.